But still, I couldn’t quite cut into my shirts. I actually went out and bought old t-shirts to try it again. (Yes, my husband gave me a hard time about this. 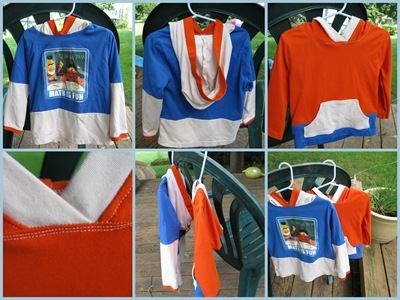 Plus somehow I didn’t think a Girl Scouts or polymer science club shirt would be that great for a little boy.) 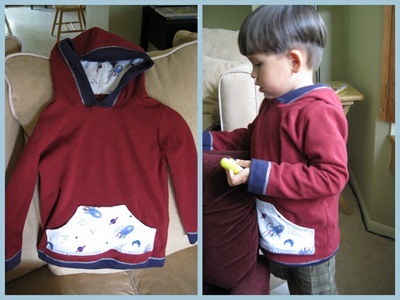 I bought 3 shirts and barely eked out 2 hoodies, one in 18 month and one 4T. One final unrelated thought. 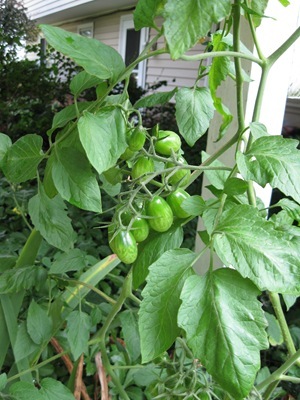 The only thing I am growing with any success this year (besides crabgrass) is an upside down grape tomato plant. It’s looking great! Sadly, we are going out of town in a few days and I suspect our tomatoes will ripen while we are gone. If the plant doesn’t die, that is. What poor timing! We live in upstate New York, and every year I have dutifully waited until the last frost date to start planting the garden. Well, our last frost date is May 20th. May 20th! Can you believe it? In the 3 years we’ve lived here, there has never been a frost that late though, so I’m always kicking myself for not getting an earlier start. If I’m lucky, I get tomatoes by September and they keep coming till the first frost, which is usually in late September/early October. Well, not this year. This year I have an eager garden helper and we have already started broccoli and tomatoes indoors, in the hopes of getting a head start on the growing season. Cute, aren’t they? BB would give them kisses all day long if I didn’t move them out of reach. He’s a very sweet boy. He helped me with the planting. We were having such fun with sprouts that I decided to get a sprouting jar and grow sprouts for eating, since BB had expressed interest in eating the little sprouts. It worked wonderfully! 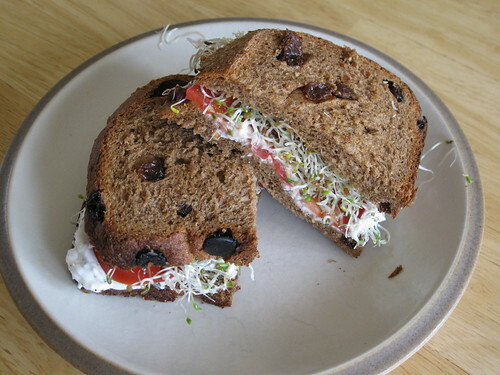 I love sprouts on sandwiches and salads, so this was a fun and economical way to get them. 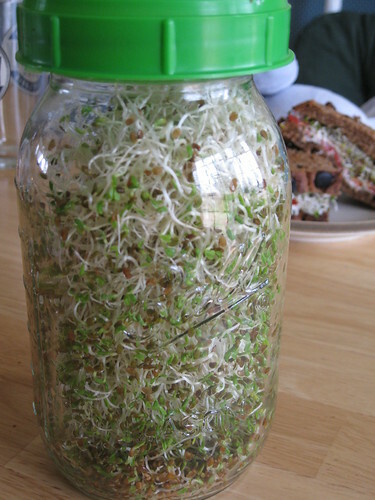 We watched them grow from just 1.5 tablespoons of seeds into a whole quart of sprouts! I told BB they were for dessert and he happily ate them. Hahaha! (I did too, by the way, lest you think I’m mean.) I have to say, a quart was a little too much. I felt like I was eating sprouts non-stop for days, so next time I will probably sprout less. I guess I didn’t really believe that such a small amount of seed would fill the whole jar! 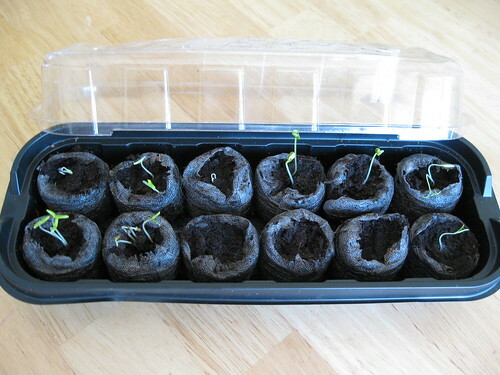 I can’t wait to get out and start planting the garden. I will probably throw caution to the wind and get started before May 20th! However, given our less than stellar garden production in years past (it’s heavily shaded, in addition to being started late), I have joined a CSA this year and I’m super excited to get fresh veggies all summer, and try new ones too. 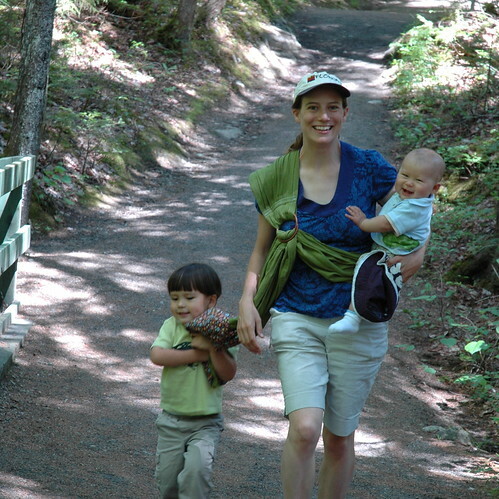 Plus I think it will be really fun for the boys to go and see the farm where their food is growing… heck, it will be fun for me too!